What is ‘painting’? A general dictionary definition of the term might be along the lines of “a process of applying paint to a surface for artistic effect”. In the world of contemporary art, this term has gained a significant amount of leeway, substituting paint for alternative media. The GRAD: Gallery for Russian Arts and Design is currently exhibiting their first contemporary exhibition TAINT which deals with the exploration of this term. Ten artists based in the UK and in Russia have produced a set of works which explore painting as a medium, challenging its definitions, motives and even relevance to social history. Hannah Campion’s mixed media canvas paintings. Own photograph. Roughly two years ago, a friend of mine stunted me with the following question: “Isn’t painting a form of drawing?” I have to admit, she wasn’t exactly wrong. If painting is the act of applying paint to a surface, then what difference is there fundamentally between it and drawing; the latter simply opts for different media such as graphite, charcoal or chalk. This is the philosophical context in which British artist and co-curator Hannah Campion’s ‘floor paintings’ make their debut. 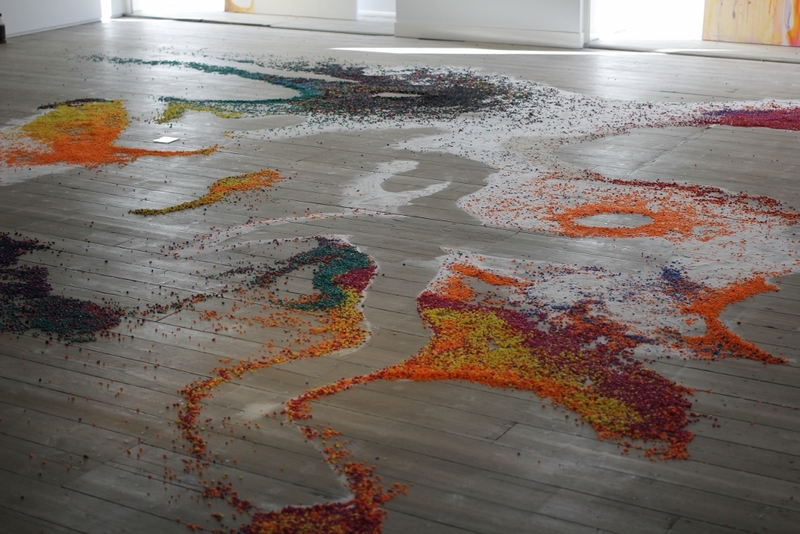 Arranged on the floor of the gallery like a vibrant abstract painting – even intruding onto the street – the ‘painting’ is exempt from its frame, from its canvas, even from paint itself – it is primarily made from sand and coloured gravel. It feels like an installation – you can even walk on it – but it isn’t site-specific either, which is usually a criterion of installation art. Her painted sculptures which take the form of an Easter egg hunt are more installation-like, making more vibrant the banal spaces in which they inhabit – corners, window ledges…I won’t spoil the rest. 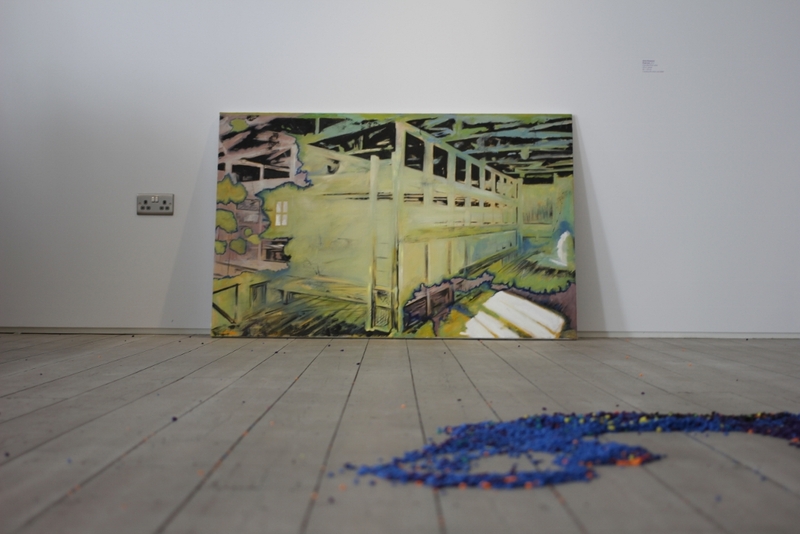 Hannah Campion’s ‘floor painting’. Own photograph. On the Russian side, co-curator Katya Sivers has produced two luminous works which deal with originality and artificiality. Prominently displayed is Towards Victoria or Sloane Square (2013), a micro-installation resembling a poster-alternating vitrine often seen at many bus stops. A blank poster has been torn from within it, a remnant of which lies underneath. Hanging on the outside of the glass vitrine are several items of clothing. Artificiality is explored in the installation’s use of man-made materials – paper, fluorescent lamps, cloth – which, being mass-produced, lose their originality. However, some of these materials are also rather fragile such as glass, and the drooping clothes help add to its analogy with human frailty. Katya Sivers, Towards Victoria or Sloane Square, 2013. Own photograph. Accompanying these two artists is Claire Undy’s Six Plasticine Balls, Three of Which are Sculptures (2013) which deals with authenticity in art. For those who watch the BBC programme Fake or Fortune, it isn’t surprising to know that fake artworks are a very common issue in the art world. Being a photographic work, it also speaks about what is real in a photograph image. But while most photographs undergo post-processing to remove flaws or correct exposures and noise, Anton Kuznetsov’s Bad Print series reverses this and makes these flaws the subject of his paintings. Plank-bed (2013) appears like a much damaged photographic print, showing the effects of time and age. The bunk depicted is supposedly from one of the barracks in the Gulag, a set of Soviet forced labour camps during Stalin’s leadership. As a result, it is laced with connotations to human suffering. Anton Kuznetsov, Plank-bed, 2013. Own photograph. 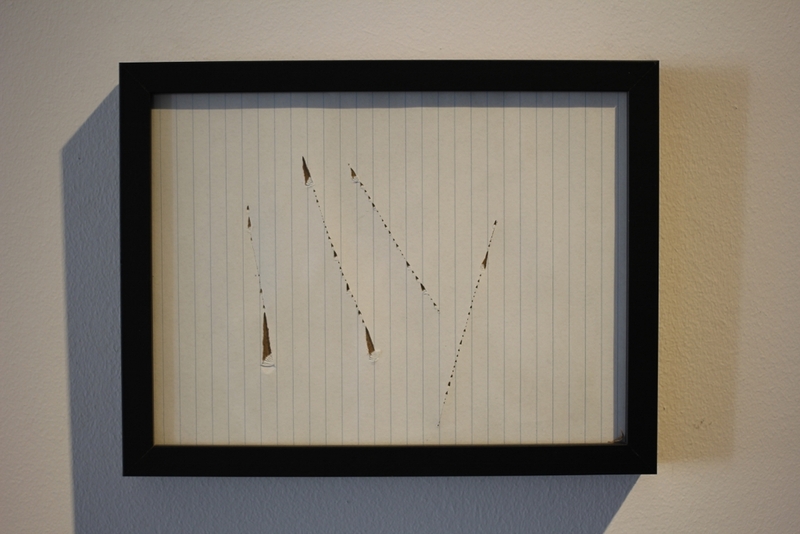 I found Jacopo Trabona’s Untitled (2011) piece of paper rather comedic, reminding me of Lucio Fontana’s Spatial Concept ‘Waiting’ (1960) at Tate Modern. Abstract ideas are expressed through a combination of scratched lines, very much like the layering of painted forms to create a picture. Adam Burns does a similar thing with line and colour in his acrylic works. Jacopo Trabona, Untitled, 2011. Own photograph. Lisa Plavinsky’s White Plein Air (2012) is a record of social protest where artists came together on the English Embankment in Moscow to paint as their theme the Moscow Kremlin, using only white paint on white backgrounds. While painting can be used as a vehicle for protest, painting itself can be protested against, as in the works of Ivan Novikov, whose monochrome paintings allude to the dismembering of colour and of paint. 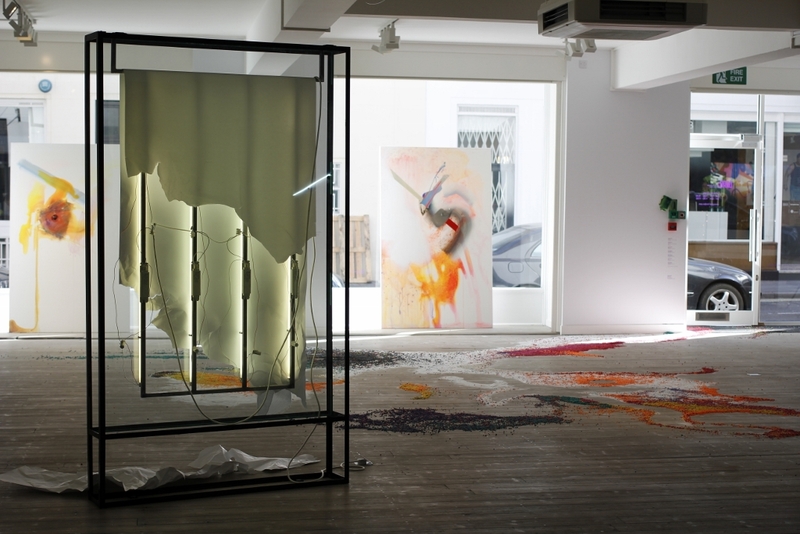 Bottles of contaminated water beneath the hanging canvases remind us of the materiality of the works of art, of the processes behind a finished painting. But is it also this layering and building up of paint which amazes the viewers of millions of paintings. Through this creative process, a ‘reality’ is created where deception is allowed to play. Heather Ross, using a montage of repetitive scenes, engages with this deceptive process of creating images and films. The fictional ‘realities’ in films are dependent on sophisticated and logical use of montage, which Ross deliberately disrupts in her video work. However, a sense of ‘reality’ isn’t always grounded on the visual, as we shall see in the aural work of Ekaterina Lupanova. Projecting a series of everyday sounds for the viewer to hear, her work is a statement against a visual world where pictures and images dominate our lives. Visual ‘truth’ is the victim here, bringing with it photographic deception. Lupanova makes us aware of our senses, the mechanisms which help us move through this physical world of ours. Though vision is one of our most powerful and used senses, it isn’t entirely fundamental to human life. As the result, the non-visual gains prominence and greater importance should be placed on the auditory to a level which recognises its importance as co-dependent with the visual. 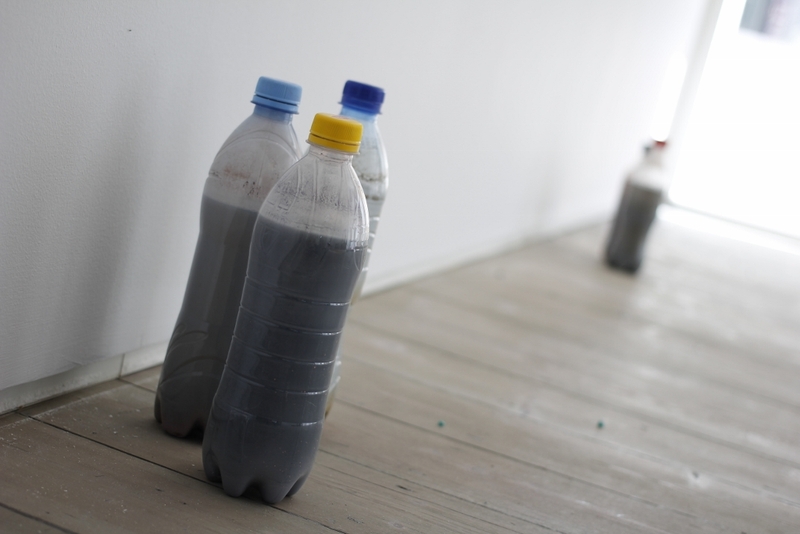 Ivan Novikov’s bottles of contaminated water. Own photograph. GRAD has certainly given us a very intense set of artworks whose meanings and concepts can leave us still at thought well after we’ve seen the exhibition. Their exploration of one of the oldest and most prominent forms of art-making is extremely insightful – If also quite difficult to pinpoint at first glance – and they comment on many aspects of the effect and processes of the art form, as well as addressing the contemporary definition of the term ‘painting’. This cross-cultural exhibition couldn’t have been better placed with 2014 being the UK-Russia Year of Culture. The interesting thing, however, is that there doesn’t seem to be a distinct cultural difference in the works exhibited. I suppose this simply emphasises the universality of the issue of what a painting can and cannot be in the global world of contemporary art, a debate I’m sure will continue on for years to come. 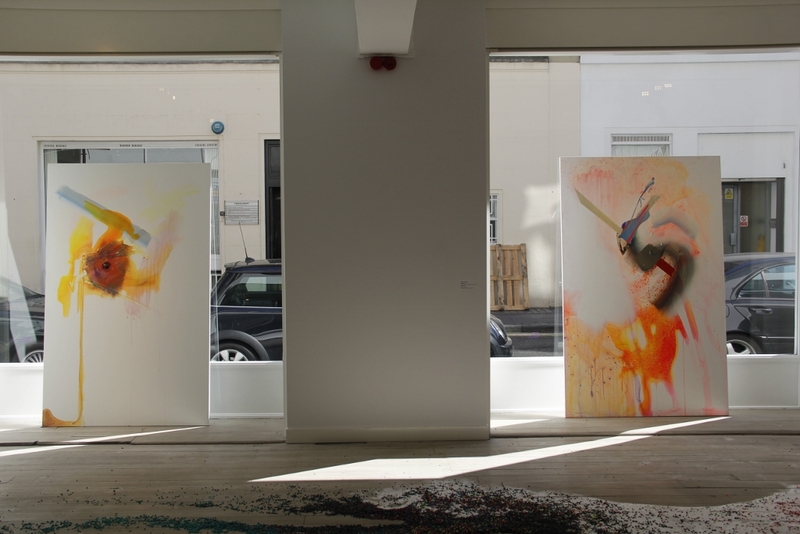 TAINT runs until 3rd May 2014 at GRAD: Gallery for Russian Arts and Design, www.grad-london.com.